My family lived across the street from my elementary school and the public branch library. My earliest memories are of going to the library with my Mom and coming home with a pile of books for her to read to me. As I got older I spent a lot of time going to the library on my own. I still have my large collection of golden books. 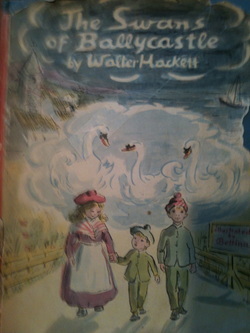 My favorite childhood book was an irish fairy tale called, "The Swans of Ballycastle." It was a typical tale of good and evil and magic After the mother died the father remarried a woman who was unkind to her three step children The children wished they could get away from her and become swans like the swans in the lake near their home. And their wish came true. Years and years and years later they returned to the town exactly the same age as they had left and in the same clothes. But, the town was no longer the same. Everyone and everything was changed. Would they stay and adapt to the changes or would they return to the peaceful life they led as swans? I remember how much I loved this book. Several years ago I worked with a group of third graders. I brought in this book and read it to them. They liked the book! Magic themes cross generations. I think they were also in awe that a book they liked was one I had loved when I was their age or maybe younger. I have always collected books. I have a collection of fairy tale books. A collection of Cinderella stories from different countries, alphabet books and collections of books of favorite authors, including Robert Munsch, Patricia Polacco, Jan Brett, Marc Brown, Byrd Baylor, Men Fox, Audrey Wood, Doreen Cronin, Sue Williams, Babette Cole...and many, many more. As I grew older and began to appreciate art and fashion my book collection grew. I have many books featuring artists I love, art history, art and fashion books for children. I love to cook so I have a collection of cook books, as well as novels, travel books, professional books on literacy and reading development, books about teaching children etc. I love reading as you can see and my mission is to motivate and encourage my students to love reading as much as I do! I always have 1-2 books that I am reading at any time.